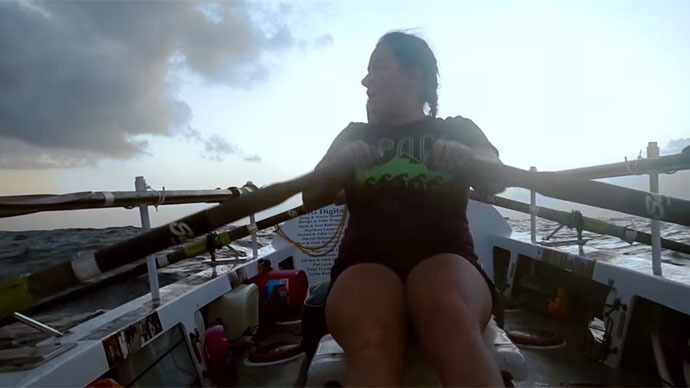 She has already beaten back a devastating car injury and rowed across the Atlantic Ocean with others, but brave traveler Sonya Baumstein from Florida is now taking on her biggest challenge yet: rowing from Japan to California alone. To get to this point, Baumstein had to first recover from a car accident that seriously injured her knees, CNN reported. It took three years for her to become fully healthy again. She credits her coach at Winter Park High School with the fact that it didn’t take even longer. “The level of fitness I was in, and my ability to stay at that fitness level and push myself there all the time, I attribute to that time on my high school rowing team,” she told the media outlet. Since then, she has gone on to become the first person to cross the Bering Strait on a stand-up paddleboard. She has also biked from Seattle, Washington to Mexico and rowed more than 2,600 miles across the Atlantic Ocean. This time, Baumstein isn’t rowing across the Pacific Ocean purely for sport. She’s actually collaborating with a NASA Earth and Space Research program called “Aquarius,” which aims to study the Earth’s climate by measuring salinity levels in the ocean. NASA says that salinity levels in the oceans can significantly impact how freshwater cycles travel around the world and impact the climate. Consequently, Baumstein will tow a small device designed by Sontek YSI engineers that can analyze salinity levels and surface temperature. It also comes equipped with GPS positioning and wireless data transfer. “This is something so small and compact and you can get data within seconds,” said Britney Jenner, a technical and applications specialist with Sontek, to ABC 10. Still, if Baumstein can successfully complete her mission, she’ll find herself in some rarefied air. While the same trip has been completed by others, it has never been done by a woman or an American.